Many science fiction stories, movies, and shows involve characters undergoing explosive decompression, the technical term for a rapid drop in pressure, usually all the way to a vacuum. Frequently, this is used as capital punishment, since shoving someone out the airlock without a suit is an efficient way of killing them in space. However, most of these depictions of explosive decompression, as well as most sources I have been able to find on the subject, disagree wildly on the specifics. 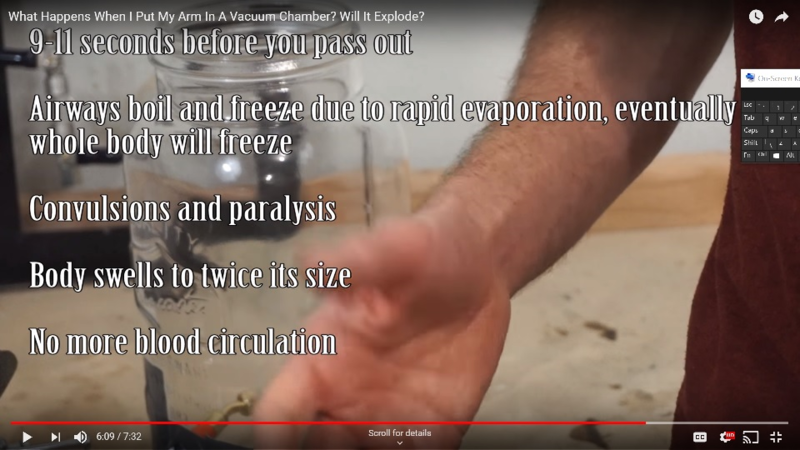 Some involve the skin freezing and/or frosting over (probably wildly inaccurate, as a vacuum is actually the best possible thermal insulator), some describe blood boiling and eyeballs exploding, and some show no outward changes as the victim appears to suffocate. The question is, what would actually happen to a person suddenly launched into space? Additionally, would the results change significantly if the victim is in sunlight, as opposed to shadow? Includes some original footage as well as interviews with people involved. Jim lost consciousness very quickly - measured in seconds. The last thing he remembers was feeling the saliva on his tongue boiling. They were able to quickly re-pressurize the chamber and he regained consciousness shortly, without any permanent damage. Passing out quickly is likely an unavoidable consequence. This is very similar to what happens with inert gas asphyxiation. In short, the extremely low pressures cause the lungs to lose oxygen with each "breath". As a result (in the case of inert gas asphyxiation) it is possible to pass out in even just a few breaths. In a vacuum of course "breathing" doesn't really make sense, but your lungs would still effectively leak oxygen out of your body, causing you to pass out rapidly (as happened to Jim in a vacuum chamber). Given this, you might consider holding your breath to stop yourself from rapidly passing out. I'm not confident enough to say for sure what will happen if you do, but all signs suggest that it will be a bad choice even if is is possible (which it probably isn't). When scuba diving, holding your breath while surfacing is a very dangerous move and is virtually guaranteed to cause pulmonary barotrauma. A severe pulmonary barotrauma can cause injuries that lead to rapid fatality such as arterial gas embolism or tension pneumothorax. The risk of pulmonary barotrauma is related to the rate of relative change of air pressure, and for scuba diving is therefore most dangerous at the surface, when moving from, say, 2ATM of pressure to 1ATM. As a result I expect that going from 1ATM to 0ATM is equally, if not more, dangerous to someone trying to hold their breath. The lack of pressure is the most dominant effect, although I'm not sure how quickly the body would actually freeze. Sunshine or shade won't matter immediately. He will freeze over regardless (due to lack of pressure), so the only effect of sunshine or shade will be to control the rate at which his ice escapes via sublimation. Warmer areas of space = faster sublimation and therefore quicker time to go from popsicle (aka frozen body) to mummy (aka dried body). For long-term results, I refer you to the relevant xkcd. What happens to the person is simple. What happens to their body involves a few more steps. The first thing that happens is you scream. Well, you act to scream or the scream acts on you. The lungs are designed to withstand about 1/10th of an atmosphere of pressure, which is the typical delta occurring during breathing. You either scream all your air out of your lungs, or that air forces its way out, doing substantial damage along the way. This effect is probably not all that important for someone being executed by vacuum. For those who want to live, it matters greatly. Divers engaging in what is called a Controlled Emergency Swimming Ascent (CESA) learn to exhale while they are ascending to give the air in their lungs a way out. This decidedly unintuitive maneuver is essential for your survival. The next thing happens is that you lose consciousness at around 15 seconds. The lungs are a powerful gas exchange mechanism, and you just exposed them to pure vacuum. The vacuum rips the oxygen right off of the hemoglobin, and then delivers that blood to the brain. 15 seconds later it reaches the brain, and you lose consciousness almost immediately after that. Death arrives soon after, as if the heart stopped beating (it may be beating, but it's not delivering oxygenated blood, so it's not helping at all). ... one 1965 study by researchers at the Brooks Air Force Base in Texas showed that dogs exposed to near vacuum—one three-hundred-eightieth of atmospheric pressure at sea level—for up to 90 seconds always survived. After that, the answer is a bit more boring. You do have issues with water boiling, but its not instantanious. Space is actually a very poor conductor, so it doesn't conduct any heat away. Your body radiates at a very low rate. Almost all of the cooling comes from evaporation, which is a very localized effect. Astronauts involved in accidents like this remember feeling the evaporation off of their tongue before losing conciousness. However, this takes a long time. At least as long as it takes to freeze in a cold weather environment. The cool needs time to work its way in (or, phrased the other way, the heat needs time to work its way out). Your eyes, however, do not typically "explode:"
Water in the soft tissues of your body vaporizes, causing gross swelling, though the tight seal of your skin would prevent you from actually bursting apart. Your eyes, likewise, would refrain from exploding, but continued escape of gas and water vapor leads to rapid cooling of the mouth and airways. In fact, one of the new space suit designs, the Biosuit actually takes advantage of this. Human skin can actually hold its own against a vacuum on small scales. Obviously, large areas of skin suffer from expansion due to fluids entering the area, but if you compress the skin at a gross level, the microscopic structure can take the vacuum. The biosuit is actually not vacuum tight. The air can escape through the weave of the suit. The result? Your body can actually cool itself via presperation just like it does in the hot desert sun! Your body emits sweat like it usually does, and that sweat evaporates into the vacuum, cooling you off! Once the effects of evaporation stop mattering and you become inert, what happens to the body is exactly what happens to an asteroid of similar size. If its in an environment that gets hot due to the sun, it gets hot. If it's in an environment that gets cold, it gets cold. This happens on a long timescale, at least compared to the 15 seconds of meaningful screaming. Not the answer you're looking for? Browse other questions tagged biology space humans hard-science vacuum or ask your own question. What would be the effects on the human body if the oxygen level increased by a lot? What might a “redesigned” ant-sized human body look like? What is the minimum human body size needed for respiration?